Rice is the most vital crop in the world. It is a staple food for more than 50 percent of people worldwide, for whom it comprises more than 50 percent of their caloric intake. The rice industry employs more people than any other industry on earth. In many regions, rice has been cultivated for thousands of years and is an essential part of history, culture, religion, and tradition. We spoke with Caryl Levine and Ken Lee, co-founders and co-CEOs of Lotus Foods, to learn more about how their purpose-driven company is reimagining the role rice cultivation can play in the world. Conscious Company: Let’s start at the beginning — how did the two of you meet? CC: What gave you the idea to start Lotus Foods? Ken Lee: In 1993, we took a two-month market research trip through China looking for a business opportunity and came back with 90 ideas. We discovered a black rice early on in our trip, and as lovers of all things food, we knew we had something special with this exceptional, exotic rice. We came home not only with a company name, but an authentic story about the rice’s origin, as well as a creative product name (Forbidden Rice) and tagline (Rice is Life) that we trademarked in 1995 when the company was launched. Also, while we were traveling through China, we learned about the plight of rice farmers and the need to preserve rice biodiversity. We began to envision ways we could share this delicious, healthy heirloom rice with U.S. consumers, while also providing a long-lasting sustainable impact and economy for rice farmers in China. CC: How and when did you transition from importers of heirloom rice to change agents for the way rice is grown in the world? CL: It’s been an ongoing process the last 15 years. Raising awareness about rice biodiversity was the first hurdle when we introduced our Bhutanese Red Rice and Forbidden Rice® (black rice) to the US market. For most Americans rice was a white, starchy side dish. We also pressed early for organic and fair trade certifications to garner better prices for our farmers. But the most significant milestone for the company was learning about the System of Rice Intensification (SRI) farming method in 2005 through folks at Cornell University. When you’re in the rice business and someone tells you about an innovative way for small-scale farmers to double and triple yields of traditional rice with less water, seed, and agrochemicals, that’s very exciting. Since then as we expanded, worked in more countries, and talked to many experts, we’ve come to understand just how pivotal rice is to the most urgent challenges we’re facing this century. Global food security, water availability, global warming, degraded soils, biodiversity loss, social equity and women’s empowerment — solving these problems will depend on how rice is produced. SRI is an innovation that can address these issues, which is why we are so passionate about it. To many, SRI means “socially responsible investing.” But it means something different and important to the rice industry — please explain. KL: In a way, socially responsible investing (SRI) could be synonymous with the System of Rice Intensification, because of the many social and environmental benefits and high rates of return on investment that the farming method offers. For instance, the Indian state of Tamil Nadu estimated that an investment of only $8 per hectare in SRI farming would generate more than $200 per hectare just in the first year, which is a benefit-cost ratio of more than 25:1. Other published studies from the Philippines and elsewhere report rates of return from 78 percent to 400 percent. The returns come from higher yields and lower production costs. CC: Tell us about the environmental benefits of SRI. CL: Perhaps the two most important relate to water and global warming. Conventionally grown rice fields require continuous irrigation with water — more than 30 percent of fresh water worldwide is used to irrigate rice fields. Irrigating rice is one of the largest drains on the planet’s freshwater resources, leading to depletion of both ground and surface water. Huge swaths of Asia are suffering from dried up wells, water scarcity and poor crops. It’s absolutely critical that we cut back on water use in rice production. The farmers using SRI methods can cut their water consumption in half, which is imperative because global food security depends on rice. Flooded paddies are also a major contributor to man-made methane gas, which has 25 times more warming power in the short-term than carbon dioxide. Researchers at Oxford University and the India’s National Institute for Rural Development conducted a Life Cycle Assessment to compare greenhouse gas emissions and groundwater use from SRI and conventional rice production. The results showed that SRI methods substantially raised farmers’ yields, from 4.8 tons to 7.6 ton per hectare, while reducing water applications. At the same SRI resulted in significant greenhouse gas reductions, both per hectare and per kilogram of rice, from both reduced methane emissions and embodied emissions in the electricity used to pump water for irrigation. According to published research studies, with SRI total global warming potential is reduced 20 to 30 percent and even as much as 70 percent. CC: How does SRI improve the lives of the farmers? KL: You can imagine the impact on a family’s life if in just one or two cropping seasons they can double or even triple the rice they have to eat. You know, many of the farmers we now buy rice from used to be food deficit. 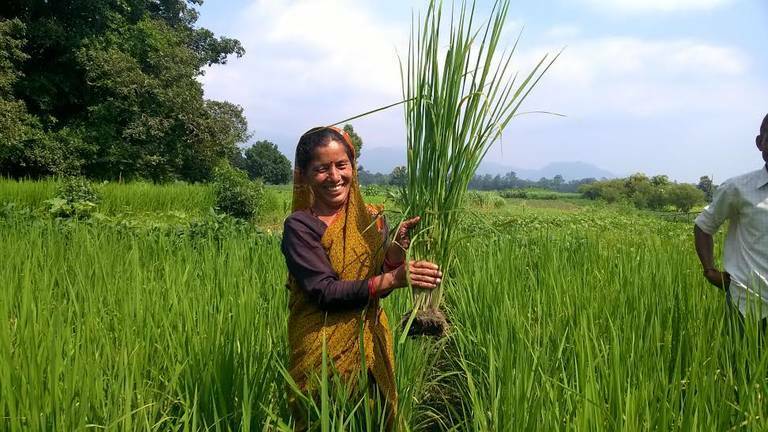 With SRI practices they have been able to go from not having enough rice to having a surplus that they can sell and receive organic and fair trade premiums, which truly transform their lives. Further, with SRI the seed rate is drastically reduced. Farmers use 80 to 90 percent less seed, so all the rice not needed as seed can be eaten or sold. So that’s another huge bonus. The reason farmers use less seed is because rather than broadcasting or transplanting clumps of older seedlings, they transplant much younger seedlings at wide spacing. This reduces transplant shock and competition among plants, both of which contribute to a healthier more productive plant. Something any gardener will understand. Less seed also means that women have fewer plants to manage. So they can get through their work faster. One of the challenges of SRI is that if you don’t keep paddies flooded weeds are more prolific. The solution to this problem has become an unexpected boon to women. Normally, women have the backbreaking task of weeding fields. With SRI simple push-weeders have been invented to accelerate weeding and aerate the soil. In many parts of Africa and Asia a mechanical device is something men use, so whereas before women did all the weeding, now men help, thereby relieving women of this chore. And when women use the weeder they can do the weeding in an upright position rather than constantly stooped over. This is a very important health benefit. In Odisha, India, for example, it takes women around 130 to 160 hours to weed an acre of rice, which they do in bent-over posture. Weeding with a mechanical weeder takes only 16 to 25 hours per acre. Another very important benefit for women is that with SRI management they do not have to work in flooded fields. You can imagine what it must be like year in year out to be slogging through muddy water inhabited by parasites and disease vectors, like leeches and snails that carry schistosomiasis. This is one of the reasons we recently launched an outreach campaign to draw attention to the benefits of SRI for women. International development agencies are talking a lot about the feminization of agriculture. What this means is that as farming becomes less profitable men increasingly seek employment off-farm leaving the women to handle the agricultural tasks. With women already overburdened with household and farm chores, this has significant implications both for women’s welfare and global food security. So it’s essential to promote innovations that can lighten women’s loads. CC: Draw us a picture of what the world could look like when you take Lotus and SRI to their full-scale potential. KL: No one has ever asked us this question, so it’s exciting to share our vision. It’s important to understand that most rice is grown and eaten by small-scale farmers, some 250 million is the number we’ve seen. If the average household has around 5 members, that’s around 1 billion men, women, and children. So there is huge scope for social and environmental change. We think SRI could drive a rural renaissance that would be characterized by more equitably distributed wealth and improved food security. With higher rice yields many farmers take some of their land out of rice and grow fruits and vegetables that bring in more cash and diversify their diets and incomes. So people’s health will improve. Less use of agrochemicals will also lead to less illness, medical costs and lost days of work as well as better soil and water quality. With SRI requiring less water, farmers will be able to continue to plant rice where water is becoming scarcer but also more water will be available for other crops, domestic uses, and to recharge water bodies. With rice-based farms becoming more profitable and productive and rural economies growing, migration to cities can be stemmed. Families will have more money to educate their children, and with more wealth concentrated in rural areas, there will be more services, jobs and opportunities to keep young people employed and engaged. One of the aspects to Lotus Foods that we find most inspiring is that you knew you had an important idea and you plugged away for years to make it happen despite relatively modest growth. Just recently you have had an important inflection point in the growth of your business. I’m sure many now see you as an overnight success. Tell us about this journey and what eventually put the company on its current growth trajectory. KL: We like to say that we are an overnight success that just took 20 years! We have one of the most challenging business models: a supply chain that never exported before Lotus Foods and thus needed a lot of hand holding and external resources; a product offering that was ahead of its time and completely new to the market thus needed constant education; and a mission beyond organic and sustainability. Essentially, the market had to grow up to meet us and vice versa. We are now expanding our offerings and entering new categories with value-added products like Rice Ramen, Rice Crackers and ready-to-eat Rice Bowls. CC: What advice would you give a young idealistic entrepreneur with an idea for a social enterprise to change the world? CL: Most importantly, you must love what you do and believe in it. Your belief in the value you are creating for society is essential to get you through the years of very hard work with little reward. It’s not always easy to get people to change how they view or do things, but it is possible and when that change happens, it is the most rewarding feeling in the world.